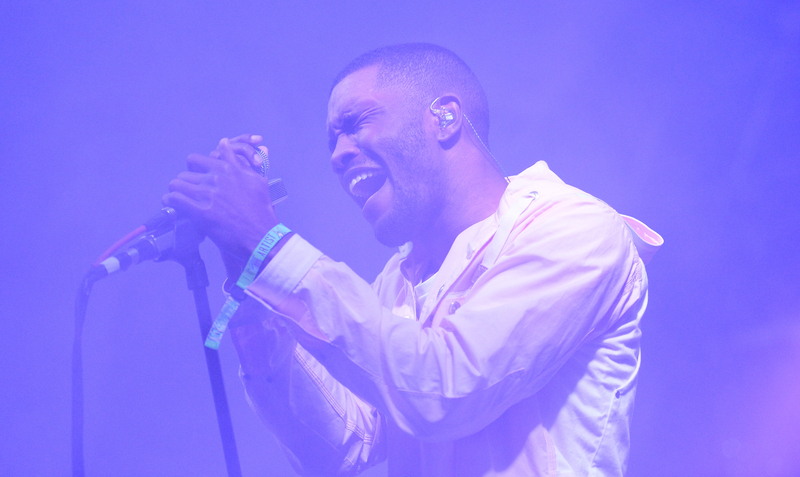 The Internet is still recovering from the shock of Frank Ocean surprise releasing his visual album Endless Thursday night, a 45 minute visual album and Apple Music exclusive. It's not as though we weren't expecting a new album from Ocean: there have been whispers that Boys Don't Cry, the album we've been expecting from Ocean for ages, will be released for the past three years. But Endless intercepted that, becoming the unexpected first Ocean album in four years. Naturally, fans started streaming to see what are the best tracks on Endless are... but, considering Endless is a visual album, it's less of a track-by-track thing and more one cohesive project. No joke: Endless is essentially a black-and-white movie with new songs beginning and flowing into one another. It's beautiful in so many ways — there's no cuts between songs, so it just feels like one big art piece more than a visual album (which is, I assume, what Ocean was going for — a film). Sure, it might make one a bit hard-pressed to figure out when songs start and stop, but not impossible — and therefore, also not impossible to rank all the tracks from best to... well, considering this is Ocean, "less best." So, that said, let's go for it: here are all the tracks off Endless, ranked. My one note on this? "Short." As in, it's four seconds long, which is just not enough time spent with Ocean. This one is... less short? This interlude lasts closer to eight seconds, and only features the line, "I need a honeybaby! Woo!" Don't we all. "Are you with me?" Yes, Frank. But can this song also be longer? “How come the ecstasy always depresses me so?” That's it. That's the song. There's a song in here somewhere, but I'm not quite sure where. It's not bad, but it's a lot of rambling until the song is over. "Deathwish (ASR)" frustrates me a little bit because there are some cool musical elements there that I think could've been neat if he just went for it full force. The potential is there, but he doesn't commit. It seems like a low-key love song of some sort — but I can't really decipher anything beyond, "You cut your teeth on sheets in Paris." Which is a great line, for what it's worth. With merely a voice and the occasional guitar strum, this song succeeds at projecting a feeling of intimacy. Also pretty short, but here it's simply disappointing, because I think this would've made for something sweet if we took a little more time on it. The vocals are in such a way that you can hardly hear the little lines of poetry in here, "Hope a garden grows where we dance this afternoon/ Hope our children walk by spring and flowers bloom." Sweet. As long as you turn the volume up, you'll find yourself swept away by the lovely little number. Also, do I detect a hint of harp? Mainly what I get hereis a beautiful sense of yearning... although it's unclean what that yearning is for, specifically. "I know you're in there somewhere," the song declares. Likewise, I know Ocean is in this album somewhere, but he is hard to find. A fairly straightforward rap that evolves into a lovely lilting song. There's nothing incredibly exceptional about "Commes Des Garcons," but it's simply fun and pleasant. It falls more under "quick" than "short," because the brevity sort of works fine here. The guitar on here is absolutely delightful, if not perhaps a bit unexpected. Overall, a very sweet blend. When "Device Control" first appears in the stream, it serves mainly as an opener, a gentle nod to technology before it a launch into the next album: "With this Apple appliance, you can capture live videos/Still motion pictures shot at high frequency/Blurring, blurring the line between still and motion." It's a fitting, robotic prelude... until it kicks in full gear at the end of the album, somewhere around the 38:48 mark. It makes for a hell of a closer, with a good pump thrown in there. It's (technically) a Wolfgang Tillmans track to be released on the artist's upcoming Device Control EP, and because of all these conflicting aspects it was incredibly hard to place. But I'll give it a thumbs up because at the end of the day, it works as a weird, listenable techno song. It's a cover of a cover: Aaliyah's "At Your Best (You Are Love)" which is a cover of an Isley Brother's song of the same name. It shouldn't be a stand-out track on this album by any means, and musically it isn't anything tremendously dynamic. But it's smooth, minimalist, and romantic. Maybe that's enough. My notes read as thus: "Higgs wins because it is actually a song." Ocean is classically rapping over the sickest Ocarina of Time B-side of all time (not literally) and it just sounds great. And finally, the song crescendos at the 38 minute mark... before abruptly ending and looping back to "Device Control." The hard truth? Endless does not work well when divided into individual tracks, but that's why it wasn't delivered to us as such. Really, it's worth listening to as a cohesive, unbreakable, and yes, endless piece... which means you should at least give the album a full run-through right now.